We are officially now a cat friendly clinic! 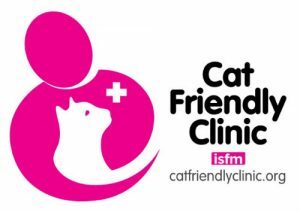 We understand that there are unique difficulties in bringing a cat to a veterinary practice and we are pleased to be announce that we have been awarded a silver cat friendly clinic certificate by the International Society of Feline Medicine. This has meant we have successfully created a less stressful and more soothing environment for your cat while visiting our practice, which is particularly helpful if you have a nervous or easily stressed cat. To learn more about the scheme please follow the link to the “international cat care” website which has some great tips on cat care. We have found that cats are much more relaxed following the above points and seem to like peeking through the glass consult room windows to observe what is going on outside! In particular having separate cat and dog consult rooms, avoiding scruffing cats and handling them with patience, as well as short waiting times in reception, help cats relax and find their feet.